I've been looking this unit for last ten to fifteen years, well from the very first moment that SART (search and rescue radar transponder) was introduced. More over I am checking this unit every week for the proper operation, not one, but six units and I know very well how it work and the operating frequency. 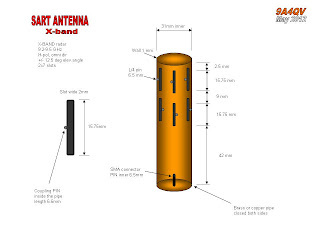 For us, it is not important how it work, but I can mention that when operative the SART is in the stand by mode, only the X-band (9.2-9.5 GHz) receiver is working waiting to be triggered with the ship's radar signal to invoke the SART transmitter covering complete band with series of pulses creating on the radar screen 12 dots from the current position to the radar location. 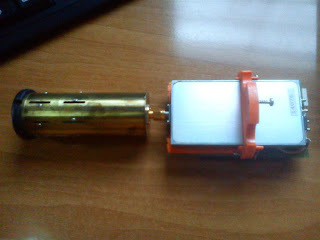 SART is using the same antenna inside the plastic housing for RX/TX operation. What can be interesting for us is the antenna!! Quick first look and I thought WTF?? 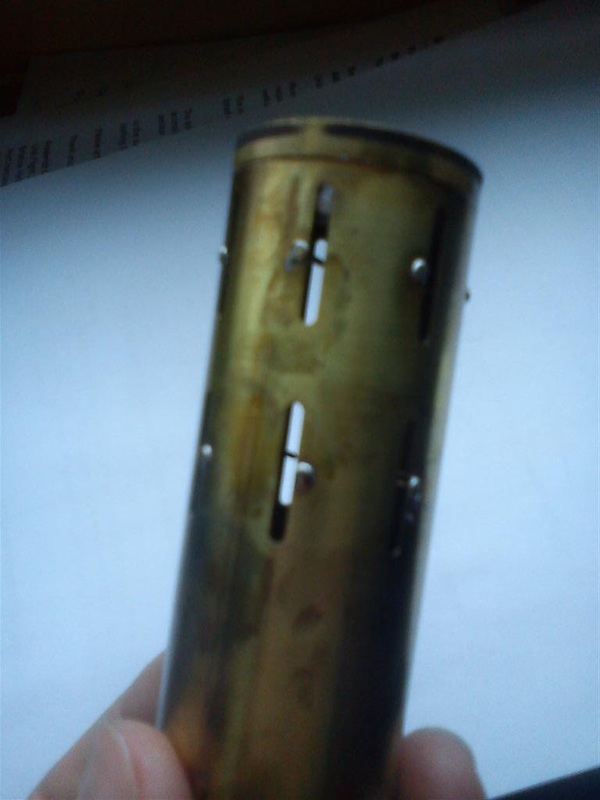 Stacked slot on the round waveguide, this can not work, there should be some catch for sure, Jotron is serious company = no f***ups there, let's examine this antenna. First thing that I notice was the diameter with 31 mm. Hmm, this is odd ?? 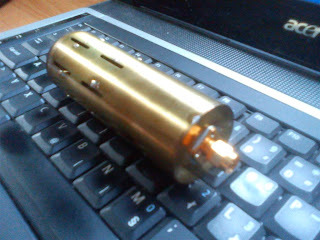 Then, vertically stacked slot with coupling pin extending inside the hollow, OK this got some sense and at the end SMA connector at the bottom. 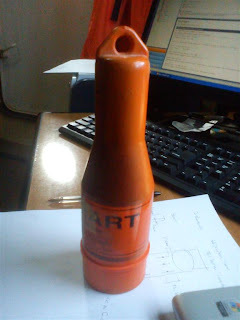 Thinking: what kind of mechanism and mode for operation is using this antenna? 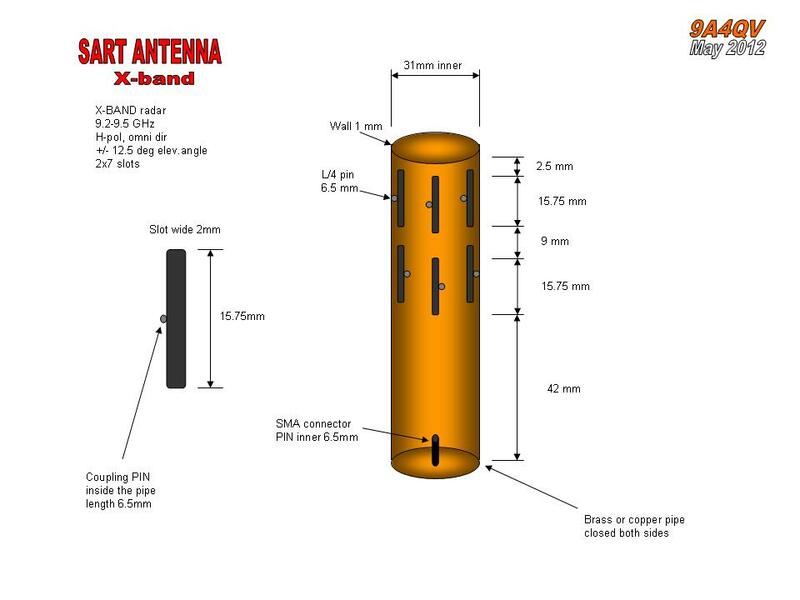 Let's stop thinking and call the antenna guru, this should save me a plenty of time going through the endless PDF antenna books and magnetics theory. The answer was prompt and direct to the point: this antenna is using the cavity properties and mechanism for propagating the energy inside the hollow. 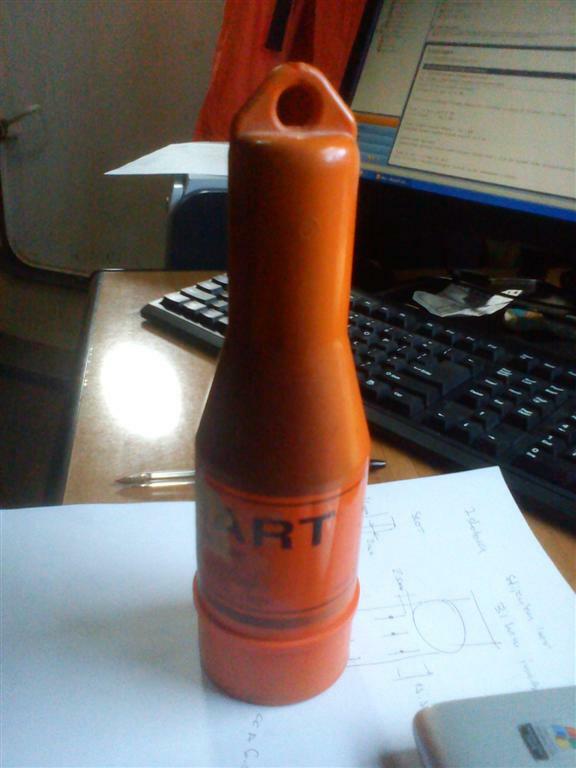 Following the cavity properties here we have a hollow metal closed structure. 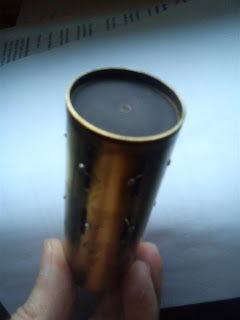 This closed resonator confine the electromagnetic fields. The electromagnetic fields inside the cavity are excited via the quarter wave length probe at the bottom through the SMA connection. The electromagnetic energy is "stored" inside the low loss cavity affected in small part by losses in cavity walls. The energy is coupled through the quarter wave length probes penetrating inside the resonator from the center of the each slot. Opposite to the dipole the electric and magnetic fields are interchanged in the half wavelength slot. The electric field is build up across the narrow dimensions of the slot which result that vertical slot is radiating the horizontal polarization. Equally spaced slots at the face of the resonator will result with omnidirectional radiation pattern. This way we manage to have omnidirectional pattern with the horizontal polarization. More gain is achieved by stacking the slots in the vertical plane. So here we have a weak photo, sorry for that, but $$$ mobile phone digital camera can not do better :-) of detail where the coupling probes are extending inside the hollow. They are about quarter wave long, same as the SMA launching probe. The measures from the design down are accurate within 0,5mm. I use just a handy ruler just to measure the antenna for those who wish to recalculate the antenna for some other bands. If you have done something like this, let me know, it will be interesting to see some directivity pattern. did "somebody" has done such antenna for 10450 Mhz ? Yes, you can contact OE7DBH. He has a few 10.450 MHz optimized antenna.